The latest Daft.ie Rental Report is out today. The main headline is that the national average rent in the third quarter of the year was higher than a year previously – at €824 compared to €822, this is hardly a huge increase, but it certainly marks a change from 2008 and 2009 when rents were fall at annual rates close to 20% in some parts of the country. In truth, while there are those who couldn’t and still can’t believe that rents are stabilising after a fall of between 25% and 30% from the peak, this is not a surprise to anyone who’s been paying attention to the number of properties available to rent. Indeed, as far back as January 2010, the signs pointed to stabilising rents. Whereas the total stock sitting on the sales market has been doggedly at close to 60,000 for three years now, the total number of properties available to rent at any one time has fallen from a peak 24,000 in mid-2009 to less than 16,000 on November 1 last. The national average hides variations across different segments, however. The stability in rents is being driven by trends in urban areas. Rents in Cork city, home to Ireland’s pharma hub, are up over 6% in year on year terms. Rents in Dublin are up less dramatically, by 0.8% year-on-year, but the size of Dublin’s lettings market means that probably had an equal impact on dragging up the national average. Rents in Wexford are still falling, down 8% annually, with rents in Leitrim, Longford and Kerry also down by more than 5%. As Philip O’Sullivan says in his commentary to the report, it’s a tale of two Irelands. And unsurprisingly, stock available to rent in the cities is what has driven the fall-off in stock nationwide. Of the fall nationally of 8,000 units, 60% has been due to a fall in the stock available in Dublin, which is down by a half in the last 18 months alone. A further 16% of the fall is due to what’s happened in the four other cities. In contrast, the stock available to rent in Connacht and Ulster on November 1 was 3,200, compared to 3,700 in mid-2009. But geography is just one way of breaking down the market. Another is by bedroom number. Given how different areas seem to have balanced each other out, the same might be true of different bedroom numbers. Whereas oversupply and the legacy of boom-time construction has flooded many provincial markets, both sales and lettings, Department of Environment figures indicate that this is not an issue for family homes in Ireland’s major cities, in particular. The correction in rents in 2008 and 2009 seems to have been one of incomes and emigration. The whole market needed to adjust and that has by and large happened. Since early 2010, trends are more likely to have been driven by supply and demand: where is the legacy of over-construction affecting the supply of rentals? And where is there at least some prospect of employment? Thus it would be nice to see how rents have changed by bedroom-and-region segment, not just since the peak but comparing the fall from the peak to early-2010 with the fall from the peak to now. Showing everything in one graph turned out to be more of a challenge than I’d anticipated. I’ve done what I can in the chart below, which will hopefully be more readable following a couple of introductory notes. From left to right, the chart is broken down into three ways. The first is broad region, Dublin, other cities, and rest-of-country, as indicated. Within each region, the colours then show the different bedroom numbers, from blue (1-bed) to orange (4-bed). The reason that there are each colour appears a number of times in each broad regions is because they are broken down into sub-markets: six in Dublin (city centre, north city, south city, north county, south county and west), each of the four other cities (Cork, Galway, Limerick and Waterford), and six main regions in the rest of the country (commuter counties, Midlands, the south-east, Munster, Connacht, and the three Ulster counties). There are two figures given for each bedroom-market combination. The lighter diamond is the fall from the peak to early 2010. The darker square is the fall from the peak to now (the third quarter of 2011). What I’m particularly interested in is segments where the square is above the diamond, i.e. where rents have risen over the past 18 months. It’s clear that in many segments of the market, rents have continued to fall since early 2010 (the squares are below the diamonds). For example, outside the cities, one-bed rents have fallen by an average of 6% in that period, while two-bed rents have fallen by 5%. And in Dublin, rents for one-beds have continued to fall. However, there are also clear differences. 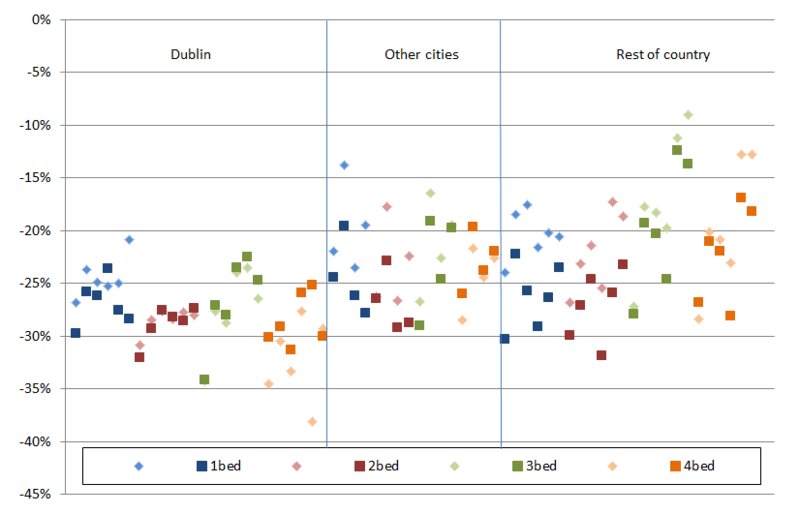 Whereas two-bed rents are clearly falling outside the cities, they look to be very much stable in Dublin. If you look at the orange squares (4-beds), they have certainly stopped falling in the urban markets and in almost cases risen by non-negligible amounts over the past 18 months. (Only the final two “Other Cities” 4-bed segments, Limerick and Waterford, as well as West Dublin have had stable 4-bed rents since early 2010.) And there is evidence of greater demand than supply of family homes to rent, with people making do with either less space (see the three-bed segments in Dublin, green squares) or greater commutes (Dublin commuter county four-bed rents have risen). Anything to be said for building new homes? While it might be too early to talk about shortages in the property market, there does not appear to be any over-supply of family homes in Ireland’s main cities. Thus, it’s frustrating to read about attitudes like Wicklow County Council’s to plots of residential land near urban centres: the ‘all hope is lost, we’ll never need new homes again’ attitude. The sooner we stop thinking of one national property market and instead of different markets around the country, the sooner it will be possible for local authorities and others to ensure an adequate supply of competitively priced housing across the country. Surprising to see such strong conclusions regarding the rental market without even one reference to the 50% or so rental properties which are being subbed up by the State. What happens if the budget see rent supplement seriously cut? A huge artificial floor would be lowered a notch. Thanks for that comment. My next post is actually about that very topic and I’ve mentioned it before when talking about the rental market. My overall conclusion here will largely be unaffected – if price floors are not binding for suburban family homes, their removal will have no effect. But, particularly when looking at the issue, I’m increasingly convinced that at cheaper ends of the market, there will be a definite impact on rents – and thus, given I believe in the rent-house price ratio – on where prices will level off.